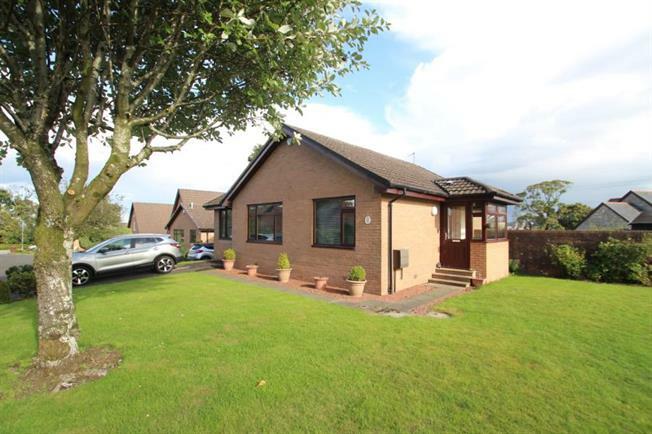 3 Bedroom Detached Bungalow For Sale in Johnstone for Offers Over £245,000. A truly beautiful extended detached bungalow situated in a desirable and rarely available location with stunning open aspects across the picturesque local countryside. The enviable cul de sac position is also sure to appeal as well as the tranquillity that this location affords. Bungalows of this style are seldom available on the market place. This impressive three bedroom modern detached bungalow is presented to the market in beautiful decorative order throughout with the flexible accommodation on offer comprising of a welcoming reception hallway incorporating storage, a spacious lounge, dining room/bedroom 3 leading to a fantastic conservatory, well proportioned refitted kitchen offering ample storage, adjacent utility room, two further double bedrooms with the master bedroom incorporating a luxury en suite shower room. The accommodation is completed by the modern family bathroom with an electric wall mounted over bath shower. The exacting specification of the property extends to gas central heating, double glazing, landscaped gardens and an excellent driveway for off road parking. The property is set within one of Houston's most sought after and popular addresses and provides easy access to a wide range of local amenities. Early viewing is strongly advised in order to avoid disappointment.